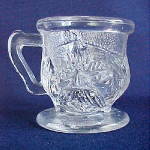 Welcome to the site of American Pattern Glass also called EAPG. I have specialized in Pattern Glass for over 30 years. Long time collectors and those just curious are welcome. Please step into my store.